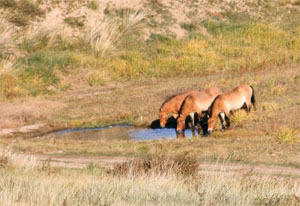 At the beginning of 1990 Holland experts took 10 wild horses “takhi” to make re-acclimatized in its own native steppe. 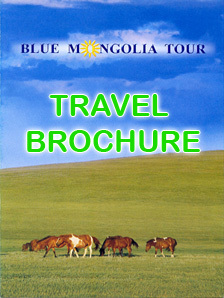 They chose the Khustai remarkable semi-steppe place, which is located very close to sand dunes and river, and established Khustai national park for re-acclimatizing wild horses. At the first time 10 wild horses were taken from Holland zoo into the place, later 12 horses were taken in 1994. In nowadays, there are more than 120 wild horses are re-acclimatizing in 13 enclosures. Mongolian and Holland parties established local small museum “Wild Horse”, that exhibits the interesting nice collections of stuffed wild horses, wolves and other rare plants samples. 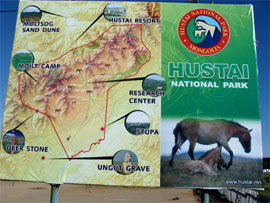 The local museum gives detailed information about wild horses and this national park area's peculiarity. 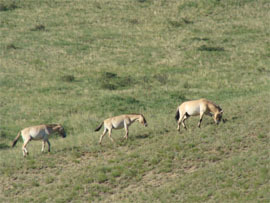 Before 1930-ies wild horses “Takhi” herds are inhabiting in Mongolian vast grassland steppe. Russian Dr.Przevalskii found this specie of wild horse firstly in Asian steppe. Therefore, the horses are called Przevalskii wild horses in the science terminology. Actually, the yellowish-red colored horse herds do not belong to anyone and they never join domesticated horses. In very short time they were endangered, eventually, it was exterminated completely.